Happy Groundhog Day! While the rest of the country finds out if they have 6 more weeks of winter or early spring. 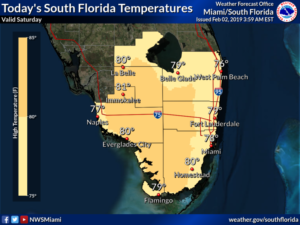 South Florida, will be in the upper 70s to low 80s with scattered showers and a few thunderstorms possible today. A high risk of dangerous rip currents remains in place along the Palm Beach County coast, and there’s a moderate risk of rip currents at the Miami-Dade and Broward beaches. Sunday morning will bring early fog along the Gulf coast and in the interior and lingering showers at east coast locations. 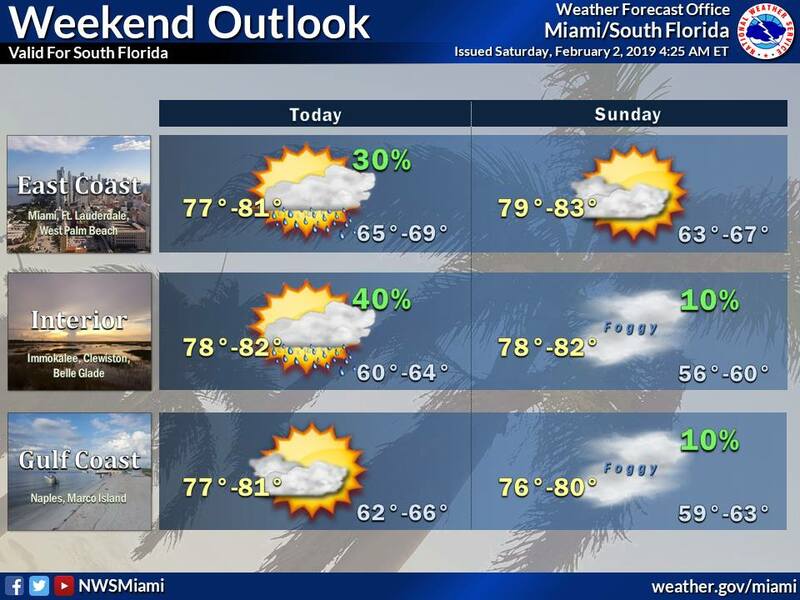 The day will see clearing skies and drier conditions. Sunday’s highs will be near 80 degrees. Monday will feature good sun and a few clouds. Monday’s highs will be mostly in the upper 70s. Look for more of the same on Tuesday — plenty of sun and a few clouds. Tuesday’s highs will be in the upper 70s. Mostly sunny skies are in the forecast for Wednesday. Highs on Wednesday will be near 80 degrees.